Since the arrival of the Honda Accord in Canada in 1976, Honda's mid-size sedan has sold more than 880,000 units, making the Accord the second most popular Honda model in the country after the Honda Civic. The Honda Accord has been the industry's best-selling mid-size sedan since early 2017. Ever since the model launched, it has remained one of the most popular vehicles in its class. Having said that, Honda always aims to improve its products, and with this in mind, the Japanese automaker introduced the new 2018 Accord. The new 2018 Honda Accord, the tenth generation of Honda midsize sedans, promises to be more powerful and efficient. It will feature more aggressive styling and some exclusive technologies. Since the arrival of the Honda Accord in Canada in 1976, Honda's mid-size sedan has sold more than 880,000 units, making the Accord the second most popular Honda model in the country after the Honda Civic. 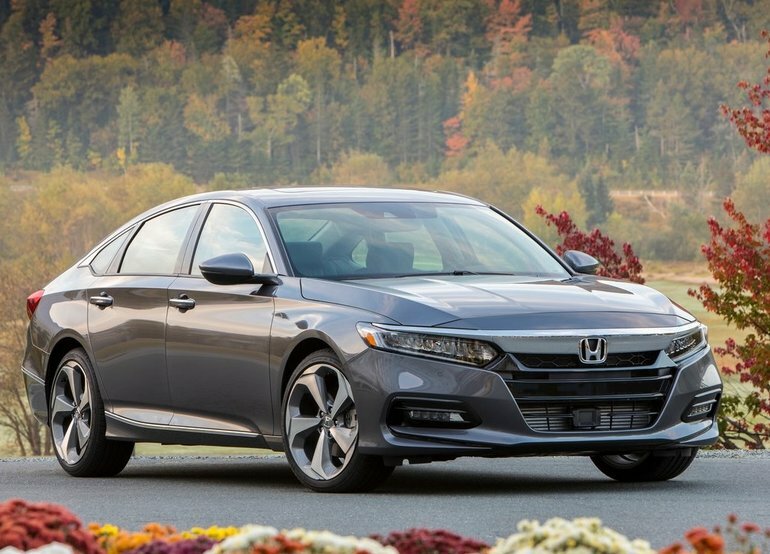 Like all generations of the Honda Accord since 1986, the new 2018 model will be built in Alliston, Ontario. The 2018 Honda Accord will be the tenth-generation model, and promises to be the most advanced to date. It will initially offer a choice of two engines, and more importantly, it will be available with a 10-speed automatic transmission, which is something no other sedan in its class offers. As mentioned earlier, two engines will be offered in the new 2018 Honda Accord. The first is a four-cylinder 1.5-litre turbocharged engine that should be quite similar to the engine found in the new Honda CR-V. The latter was also completely redesigned last year and received a turbo engine for the first time in its history. Honda has not confirmed the power of the engine under the hood of the entry-level 2018 Accord, but it should not be far from the 190 horsepower featured in the new CR-V. This engine will be paired with a continuously variable automatic transmission or a 6-speed manual transmission. This engine is sure to please those that like to have complete control over their engine. The biggest change found in the 2018 Honda Accord, however, is the new 2.0-litre turbocharged engine that can be combined with a 10-speed automatic transmission, which is exclusive to the mid-size segment. This gearbox should allow the 2018 Honda Accord to deliver an even more impressive performance in terms of comfort, fuel economy, and performance. In addition, the 2.0-litre turbo engine is expected to far outpace the current V6 engine while being more fuel-efficient. Finally, the new generation will continue to be offered with a hybrid engine, which has also been upgraded according to the Japanese manufacturer. We will know more about the upcoming 2018 Honda Accord in the coming weeks. For now, do not hesitate to come and discover the current 2017 Honda Accord, the best-selling car in its segment at the moment. For more information, contact us today at Halton Honda!